At 10.00am on Saturday November 26, 2011, about 300 cyclists gathered at the Leighton Beach picnic area in North Fremantle. All were suitably attired in old fashioned tweed and hounds tooth period clothing and were taking part in the annual "Fremantle Tweed Run". 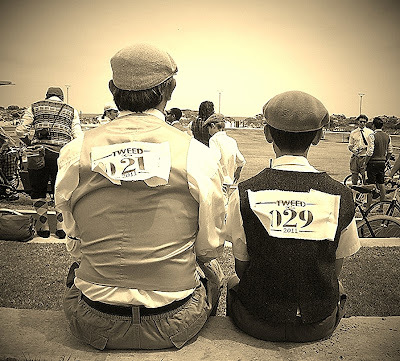 Most of the bicycles ranged in age from 20 to 30 years old, some bicycles were newer, and some were older original vintage bicycles from 1950's. 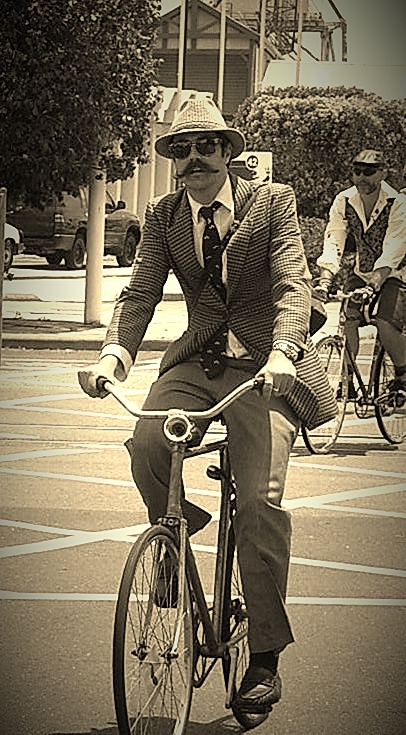 Some bikes were single speed (fixed and free), some were old three speeds, and others had ten or more gears. The diversity of the bicycles was mirrored by the age of the participants.... some children as young as 10 rode in the event, while other riders were in their 60's. 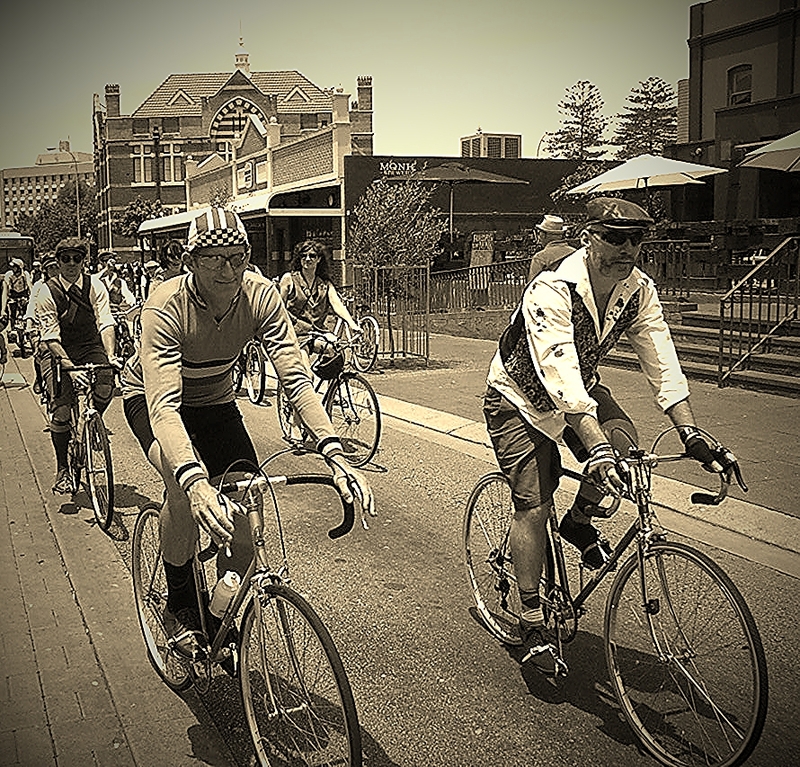 Even with all of this diversity the participants had only one goal in common.....to cycle in a relaxed and enjoyable group through the streets of Fremantle. 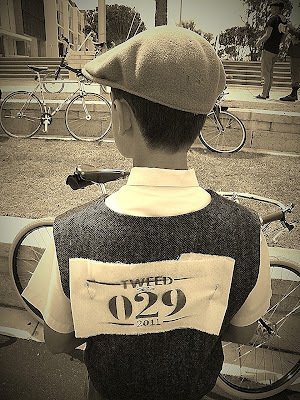 After all of the riders were fitted out with numbered calico "Tweed Run" bibs, the participants were addresssed by the friendly event coordinators. The numbered calico "Tweed Run" bibs. 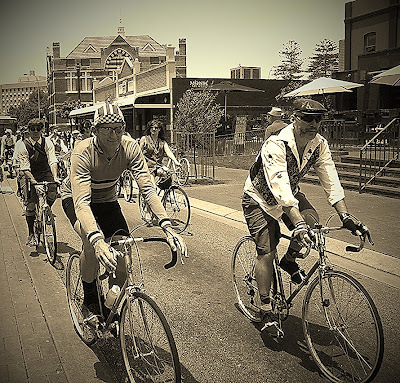 Once clear instructions were delivered to the group, all of the cyclists headed off for a relaxed ride toward Fremantle - with the first meeting point being at the E shed markets on the Fremantle wharf. 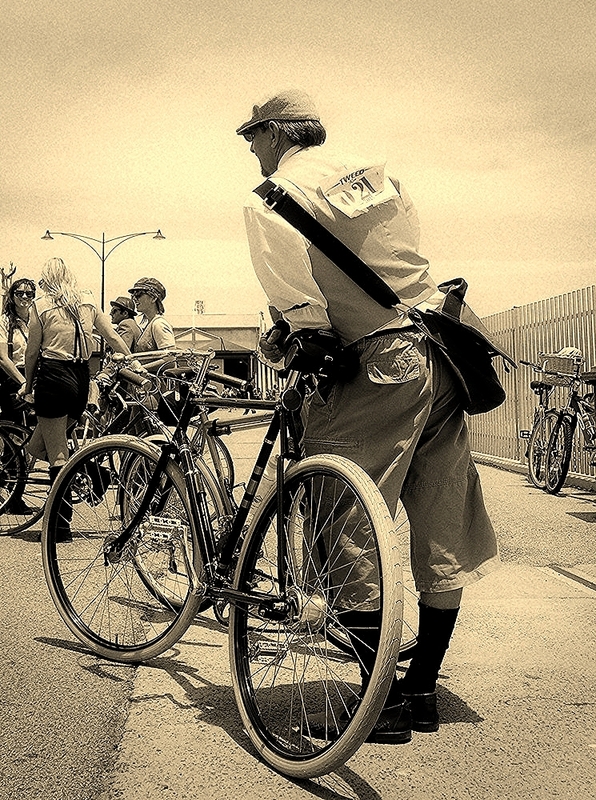 Departure times were staggered across smaller groups to avoid congestion on the narrow cycleways. Near the E shed markets the replica of James Cook's ship "Endeavour" was tied to the wharf. 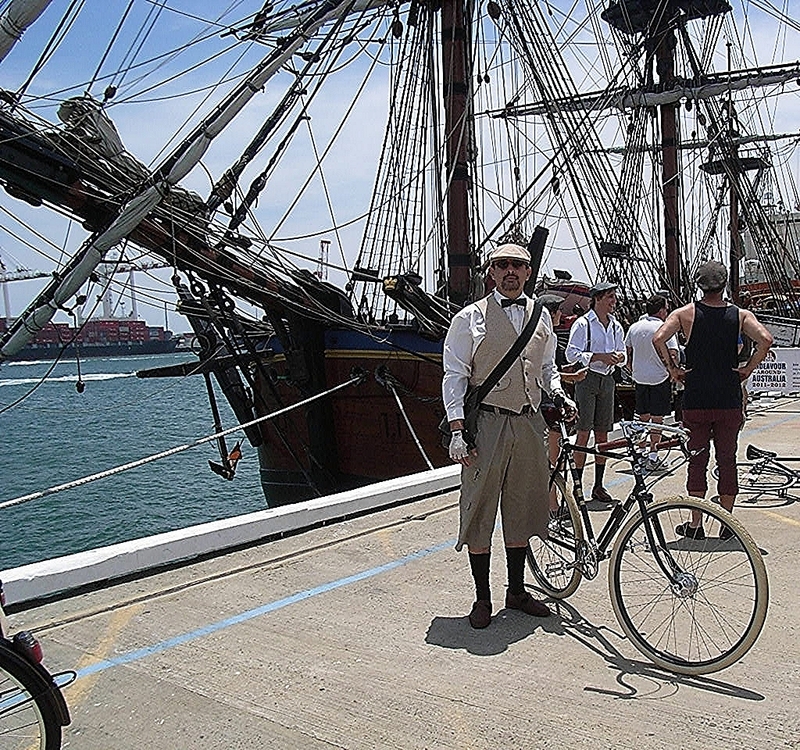 The ship provided a fantastic backdrop for the riders and others to enjoy the gathering. 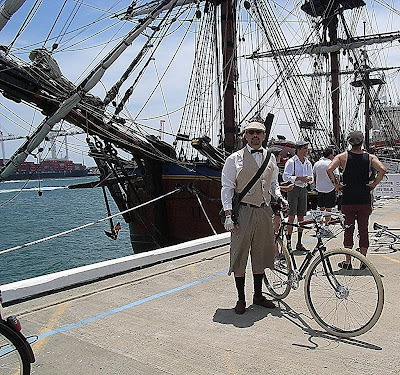 After a 20 minute break on the wharf near E-shed the group rode as one through the Fremantle townsite, eventually travelling along South Terrace and down Cantonment Street toward Clancy's Fish Pub.﻿ As the group rode through the streets of Fremantle on-lookers were impressed by the well dressed men, women, and children riding stylish older steel bicycles. Once at Clancy's it was time for something to eat and drink, the cold beer (of couse) tasting exceptionally good!! Live music entertained the crowd who stayed to enjoy the relaxed atmosphere within the grassed outdoor area.